Uganda had endured 15 years of tyranny and civil war when Yoweri Museveni seized power in 1986. Despite a long civil war in the north, President Museveni has restored order to most of the country and liberal economic policies have led to growth. But earlier this year the United Kingdom cancelled some aid in protest at the changing political climate. Uganda also faces the challenge of Aids and malaria. Next month a referendum will decide whether multiparty politics are introduced and critics fear the constitution will also be changed to allow a third presidential term. What does the future hold for Uganda? What is your view on the political changes? Can there be peace in the north? What lessons does Uganda hold for the rest of Africa? Send us your views. President Museveni answered your questions in a special edition of our global phone-in programme Talking Point. Museveni is the man of the people, he lives an ordinary life of a Ugandan citizen. He fought for the people, restored order in Uganda and now the the International community should leave Ugandans to decide the political future of Uganda. Peace in Northern Uganda is within reach, its a matter of days. Museveni has been a great leader who seems to be back tracking. The referendum and many other issues are just ways of him portraying Uganda as a democracy. How far will Museveni go in pleasing the western world to further his ambitions before Uganda ends up as another Zimbabwe? I believe it is time for you to step down in order to allow fresh and innovative thinkers into the political debate. I don't have any doubt that you have brought stability and leadership to your country. However, I believe that Uganda is not lacking of intelligent and energetic political minds who are willing and eager to move their country forward. There should be a multi-party system in existence because it has been proven that diversity of opinions or political views are the true pillars of democracy. In essence, no one man's opinion is the ultimate. You should stand down and allow fresh minds into the political arena. Do not fall into the mindset of other African leaders who believe that they are their people's savoir and therefore only they have the right to rule. Give democracy a chance. Do not stand in the way of your nation's progress. I once had the pleasure of representing Uganda at a "Model UN" conference, and I just wanted to say that although many people admire and benefit from your strong leadership, particularly on issues like Aids, would you please step down at the end of your second term, in order to show that democracy and peaceful transfers of power are both possible and encouraged after a legacy of civil war and tyranny. We still need you Mr President, I must say you have done commendable work for Uganda and you should continue. I know given another term as a token of appreciation in recognition of your effort to bringing peace in a country that was rotting, but my only advice is that, this time round please try to bring in young cadres like us with clear vision for the country not fallen cadres who will later on turn around and blame your effort that you risked your life. I've just finished my MBA from London school of commerce and looking forward to coming to Uganda to preach the gospel of True leadership Bravo Museveni. It is said by some people in Uganda, especially those leaning towards the "opposition" that the results of the referendum on various issues is well known and that therefore money should not be "wasted" on an exercise whose outcome is known. I disagree. The record needs to show how the citizens actually pronounce themselves on important matters. Recently it was well known that the voters in France and the Netherlands were going to vote no to the European constitution but that it did not stop the authorities there from going on with the exercise. Important changes to the way we are governed cannot be decided on the basis of the gut feeling of oppositionists or other "enlightened" observers, otherwise elections would be decided by opinion polls. So the referendum must go on. It is time to go! Leave a legacy as someone who has the integrity to leave power. Watch over your country to make sure democracy has root. It is greediness, if you are trying to perpetuate yourself in power forever. Remember the day of judgement! I wonder why the Great Lakes region chose Museveni to give lessons to war-torn Burundi. His country faces war, too. He has not found a solution. At least Burundi has a multiparty political system, Uganda does not because Museveni does not want one. Watch out, Mr President. Tomorrow you may receive lessons from those you were looking down upon yesterday as Burundi is now going through a reconciliation process and democratic change. Mr President I have had all my education in the 20 years you have been in power. I grew up admiring you. In my secondary school, I saw another Mandela in the making. Why can't you now rest? You have showed the country what to do and we appreciate all the good things you have done. Turn down their calls for you to stay on. We don't want you to go into exile like your predecessors. Believe you me; what happened to them can also happen to you. Mr Museveni should be saluted for all he has done for the people of Uganda. Citizens have a voice and there is freedom of speech. So, I believe that the people will decide the best way forward through the referendum. Multiparty politics have caused a lot of suffering due to tribalism. I hope this time it will work out. My greatest worry is the transitional process. May God help Uganda. I absolutely have no doubt on your profound style of governance. It's hard to imagine where Uganda would've been had it not been for you toppling the last regime. Democracy has its limits, considering where you picked the country from. The future indeed looks rosy if President Museveni can be allowed to steer the country through the tunnel till we, Ugandans can see the light. It's been a long trek through mountains and valleys but I am optimistic that Mr Museveni will deliver as he has done for the past few years. Best of luck Mr President. The future of Uganda depends on Uganda's legislature, judiciary and executive power. Firstly, the legislature must prudently vote what is good for the country. Secondly the courts have to diligently set laws that are fair to all Ugandans. Finally, the executive powers that are presidential must respect the constitution set up to steer the government. At the moment the president wants to change the constitution to stay in power for longer than two terms. His goal is to be the first president of the East African Federation! Uganda now needs change at the helm as hopefully then the war in the north may come to an end. Uganda needs to learn from Kenya, Tanzania, Malawi and Zambia. These countries are democratic and they are enjoying the advantages of democratic values. Museveni has done a lot for Uganda and East Africa, but at times it is good to quit while things are not too bad, not forgetting Museveni has not been able to stop the civil war in the north of Uganda. We have an inherent problem in Africa where leaders don't want to give up power after being in there for a long time. Museveni can take a good leadership example from world renown South African former president Nelson Mandela. He gave up power honourably. You should come back in 2006. We still want your leadership. In order to register as a political organisation, the National Resistance Movement collected millions of signatures countrywide. These signatories were endorsing the opening up of political space. If we know that millions have endorsed your party and the other parties are in support of opening up, why waste tens of millions of dollars on a referendum? The outcome is already known and it is not a legal requirement. There is no doubting the change brought to Uganda under Museveni's presidency, for which he should be congratulated. However, is it not time to see a new face in charge? After all Museveni has done he's risking his reputation to emulate that of former President Moi in Kenya in terms of hanging on longer than was in the country's interests. It wasn't until Moi retired that the extent of corruption under him was unveiled. I hope for Ugandans' sake they do not follow the same fate. Mr President, I personally don't have any problem with your third term project and lifting term limits for the presidency. Some of your ministers have also said that term limits are outdated and that countries like UK don't have them. That is right. But UK is a democratic country. In UK, leaders don't steal elections. In UK, leaders don't use the army to terrorise opposition groups. And in UK, leaders don't bribe MPs to change laws. I was four-years-old when Mr Museveni became president, I am 23 now and if Mr Museveni allows parliament to amend the constitution and God forbid he runs again, I will be 28 when the new term ends, probably married with children. My point is, African leaders never know when to quit and Museveni is no exception. What more, surely, can he do for Uganda that he hasn't been able to accomplish in the last 19 years? The North has been a disaster, unemployment is ridiculously high, much needed aid is being retracted, and corruption is at a high, need I say more? Museveni's legacy will be preserved if he steps down when this current term ends. If he stays, am afraid Uganda's future is a blur, with tumultuous times ahead of our young, so called democracy. President Museveni undoubtedly must be commended for the leadership he has provided for Uganda. The fruits of that leadership are there for all to see. But like a hen who has laid and incubated its eggs, he better not sit on them for too long lest he crushes and destroys what he worked and nurtured for so long. President Museveni has indeed done some very good things for Uganda. The referendum is indeed a waste of taxpayers/donor money, that can be better be spent on health, education etc. It's high time the Movement government came up with an alternative presidential candidate and give Museveni an opportunity to retire peacefully having played his part in the development of Uganda. Hello and welcome to a special edition of Talking Point. I'm Mike Wooldridge. Uganda is facing a political watershed. Nineteen years after President Yoweri Museveni and his National Resistance Army swept to power, Ugandans are to vote in a referendum on whether to return the country to multi-party politics. The President backs the move. But at the same time there's been controversy over whether he should be able to run again after holding the reins of power for so long. We're in State House, Kampala, and Yoweri Museveni is our guest today on Talking Point. Welcome, Mr President. Your calls in a moment but let me begin with this email we've received from Joshua Nanyumba in Toronto, Canada: Mr Museveni I am proud of the developments you have done for the nation so I would wish you to show other African leaders a good example by resigning at the end of your term so that the whole world can see the democracy you meant when you came to power with your famous speech "Ours is not a mere change of guard but a fundamental change". And Amin Kiggundu from Kampala in another email puts the question rather more succinctly: Mr President I would like to know whether you will be standing for the presidency in 2006? Well it does look as if it is becoming possible for you to stand again with parliament this week coming out in favour of ending the current two-term limit for the presidency - so will you stand again for a third term? The question of who stands on behalf of the movement is decided by a delegates' conference. So that's where that issue will be decided. And in deciding who stands, the delegates take into account many considerations. The debate which has been going on which has now been resolved is whether we should have a flexible constitution or a rigid one and I favour going for a flexible constitution on the question of time limits, that's all. But as to standards that will be decided by the delegates' conference. Right, so it's down to the delegates' conference. Now if they do ask you to stand, what would you do? We shall decide that when we get to the delegates' conference. I don't make up my mind until the delegates' conference makes up its mind and then the candidates can respond to that. But the important thing is that we have a flexible constitution on that issue rather than a rigid one. And when we studied the issue, the merits and the demerits, we were not convinced about the merits of time limits. Let's bring in our first callers on the issue. Let's go first to Margaretta Wa Gacheru from Evanston, Illinois in the United States. President Museveni, I was in Kenya from 1974 and was taught at the University of Nairobi by many Ugandan exiles and am a great admirer of you. I have witnessed the suffering of the Ugandan people and really appreciate what transpired in 1986 when you came to power. I know there have been many obstacles that you have confronted. In reading your book, What is Africa's Problem, you outlined a very large vision for your country and for Africa. I'd like you to talk about what you feel is the biggest obstacle you have been faced with in realising your vision and how you have striven to overcome those obstacles. Could you do that for me? I think the question we're addressing here is - you describe Mr Museveni as a man of vision; do you then want him to continue in power? Myself, I think that Mr Museveni should continue. I think he has a vision that he needs to fulfil and if the people want him to do that, I think he's the best man for the job. I wonder if he feels that he can do that. Is he capable of overcoming the obstacles that he's confronted with? Well just before you answer that Mr President, let me also bring in Allan Ayella from Manhattan, Kentucky, in the United States. 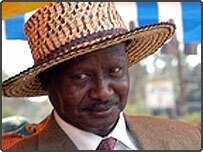 What do you think about this issue of whether Mr Museveni should be able to run again for the presidency next year? I want to first of all thank Mr President for the wonderful and beautiful things that he has done for Uganda. I want to thank him for him for his leadership and all that he's done. But I do not think that the President should run again for a lifetime presidency because in his own manifesto in the last election campaign he said that he wanted five more years to professionalize the army. So it looks like all pointers are pointing to the direction where he's trying to cling onto power which I do not think is really appropriate for him at this time. I don't he should run again, to answer your question. I think he should show a difference - there should be a clear cut difference between him and the former leaders that we had because he's been really good and it would really tarnish his image to start manipulating the constitution and all that is going on right now. Let me stop you there then and put both of those points to Mr President. One says you should stay, one says you should go essentially. Well you see the real answer to Uganda is that we should give that sovereignty to the people of Uganda - to the electorate. There's no need for us to render our voices hoarse with that issue because the owners of the land, the electorate, they should be the ones to decide whether a leader should lead them or not. That is our conclusion - the conclusion of the movement, once we studied the American constitution in particular. When they debated this issue in 1787, '88, '89, when they were writing their constitution, these issue came up. Should they have limited terms, or should they have unlimited terms? And at that time they said they should not have unlimited terms until later - until about 50 years ago when they changed it. But we benefited a lot from studying the arguments which were being put forward by those delegates in the American constitutional conference. It's not a question that Mr Museveni is saying of what he wants - it's up to the people. We had a referendum about five years ago; that was again on either we should have a multi-party system and a lot of irregularities that happened. But finally it came out clearly that the people wanted a movement even if there were manipulations of the referendum. My question is that Museveni himself said he wanted five more years to professionalize the army. I shouldn't see why again there should see taxpayers' money being wasted to debate this issue when it was his lips that said this and I don't see why the referendum comes in at this time. It shouldn't even be a point of argument. If it was said we are switching over to multi-party after this five years or we're maintaining the movement that should be the question that should be addressed. Not him in particular that seems to be holding the light and pushing the candle towards the lifetime presidency which would be disaster for Uganda. Allan Ayella thank you very much indeed. A disaster for Uganda, he's suggesting. He's talking of the referendum¿. And the spending of the money on it and so on. Yes, but you see the problem is that we are talking to people who don't know much about our history. In Uganda we have, if you like, a dual system. The people who come to parliament come to parliament after passing an educational qualification. You cannot be a member of parliament unless you have finished advanced level education. That's when you stand for elections and then if you are elected, you become a member of parliament. Now I think about half a million people have been through an advanced level of education in the last 50 or so years. That means there are 11 million or 12 million people who have not been through a level of education. Therefore, you come to a crucial issue like whether we should open up the political space for the parties, it is so important that we must ask, not only the elite, but also the population themselves. That's why the referendum is very important. There are many people among the 12 million voters who could not stand to be members of parliament. There is a sort of class barrier - educational barrier - in our electoral system. That's why the referendum is very, very important on these crucial issues. The referendum of course, once again, just to remind people being on the whole idea of whether there should be a restoration of multi-party politics or not. Let me bring in our next caller Bosco Ssendegeya from London. I gather that one of your concerns is that, Mr Museveni, if he does retire, if he does end his presidency next year when the current term expires, that that would be under foreign pressure - that's what you're worried about? Yes, my worry is that there's increasing pressure from the international community, especially the donor countries, for you the President to step down, while at the same time there are very many people in Uganda, especially in the rural areas and women who want you to continue to be their leader. Given this opposing situation, can you tell us what or who you will follow? So Mr President, are you doing this under foreign pressure? Are you even moving towards - now backing a move towards multi-party politics because of foreign pressure, is that right? Not at all. There has been foreign pressure on so many things but we never listen to that foreign pressure unless our own thinking coincides with that foreign pressure. In 1971, when Amin came to power, he was supported by western countries. One of the first countries that supported Amin was Britain. Edward Heath, within 10 days, extended support to Idi Amin. Other western countries supported Idi Amin. We opposed Idi Amin, in spite of the stand of the western countries, until we got rid of him. Later on the western countries changed their position in 1972 when Amin expelled the Asians. Then when he fell foul of the western countries, the eastern countries supported him - the Arab countries supported him. We opposed Amin. The history of our movement is that we follow the interests of our people; we don't follow what the outsiders say. We may take it into account, we may talk to them, but in the last analysis, we go with our people. That is the history of our movement. Therefore there is no foreign influence that would have made us go to multipartyism for instance or to opening up the political space, if we also did not think that it was time to change. But your dependence on foreign aid though does potentially make you quite dependent on influence, indeed even pressure, from donor governments from the international community, doesn't it? Not in the last analysis. I want to tell you something about aid - all of you who are listening. It is now 48 years since Ghana got independence as the first black African country. Not a single African country has transitioned from third world to first world because of aid. They are all there for you to examine and many of them have received a lot of aid. Therefore aid by itself is not a factor of transformation. It can be used and if it is used properly to bring transformation. So you're suggesting you'd be prepared to forego the aid to follow what you believe to be right? Absolutely, absolutely. Aid is not such a crucial issue as far as we are concerned. It is welcome if it is available but it cannot decide our destiny. Let's see what are next caller feels about that and indeed this whole potentially new political direction that Uganda is taking. Benon Muwong from Cape Town, South Africa. What's your comment about what is happening in Uganda at the moment? I would like to commend you on a job well done and I hope to see you see stand in the next election. My question is about the media. I would like to know - first the media in Uganda is still very young, has a lot of potential. What policies will you put in place to ensure that the internal media reports accurately and in an unbiased manner to people especially on the issues that are potentially polarised into to the population? Benon Muwong - one of his concerns is that there should be free but also fair reporting here. Presumably you would hardly disagree with that? One of the things he's worried about is that the opposition might, as he puts it, intimidate the public by making unjustified accusations and so on. Absolutely. Some of the papers are not very professional and they tend to publish alarmist news, alarmist information which is not researched. But at the end of the day isn't freedom of the press an extremely important principle too? It is important but you remember that in the case of Rwanda, the radio was misused to promote genocide. There was a radio which was inciting violence and I'm told - I was watching the film recently that the Americans thought of jamming it at some stage but somebody told them that it would interfere with the freedom of information and that radio went on and caused the death of 1 million people. So people will misuse the media - it can be the real enemy of freedom also. Let's bring in another caller now from here in Kampala, Muwanga Kakooza. Your question to President Museveni. Former president, Godfrey Binaisa, is quoted to have said that ''the chair is very sweet''. Having been in power for consequent years, do you agree with the former president Binaisa? Maybe the chair was sweet for Mr Binaisa but for me the chair is not sweet to me at all and I have been in the chair of resistance for the last 33 years because I've been in the struggle - against Amin, against the systems we are fighting. So to me I look at it as a continuous struggle. This is a phase - when you have been in the government - it is just one phase like when we were fighting. Unless you served by struggle like against Amin for 8 years then continuing for another five - maybe the chair of resistance was sweet. But it is a long time ago of course you left the chair of resistance in the bush and sat down in the chair here. Muwanga Kakooza, are you suggesting by your question that Mr Museveni is perhaps finding the chair too sweet? Or do you think that he should be continuing in office after next year, if the public vote for him? I wanted to get his position. I wanted to know whether what President Binaisa said, whether it applies to him - whether it is true that the chair is very sweet, that's why he doesn't want to leave? I don't think of the chair as sweet or not sweet, I am here on assignment, just as I was in the resistance. Well another enigmatic answer perhaps on what the future may hold. We bring in our next caller now, also from Uganda, but from Gulu in northern Uganda. Your perspective, Moses from Gulu - and of course your part of the country is one where the government is still engaged in a conflict with the Lord's Resistance Army and has been indeed almost ever since our guest today, Yoweri Museveni, came to power. What do you want to ask the president? As you said I come from an area that is terribly affected by war and I feel this is a challenge for the President because if he's been in power for 20 years and up to now there is no peace in the region, we feel he should give the matter to somebody else to try and see if the people here can get peace. Because for all these years surely we think somebody could have fresher ideas that can bring peace for the people in northern Uganda. Let's put that to Mr Museveni. So that suggestion then that you should give up in this case because you failed to bring peace to the north. First of all on the issue who leads Uganda. According to what we are saying now in the constitutional review process, either it should be up to the people of Uganda in regular elections. So if our friend from the north - if Moses is of the view, that because Museveni has been in power for a long time and he should therefore not be a leader in case he presented himself for fresh election, then he says so in a vote. And others also say what they think and then the sum total decides who should lead us. So we are going back to the same issue; who has got the power to decide. However, coming to the reasons why, the conflict in the north has dragged on; it is because of the geo-political factors which many people know. The government of Sudan was backing that terrorism and we had to confront the government of the Sudan. It spilled over into Congo and we had to confront the regimes in the Congo and the geopolitical factors behind that conflict are well known and I'm sure even the people in the north know them. We had no shortcut for those problems. Eventually the peace in the Sudan will have spin-offs in northern Uganda also. Even if there are geopolitical factors, I do think many people find it surprising that somebody who managed the kind of campaign that you did in the bush - eventually of course to topple the government here - to remove the government in Kampala. A real expert in military strategy hasn't been able to conclude the war in a shorter time than this, even despite what you were just saying. So the conflicts last long. The conflict in Northern Ireland, you remember is nearer home which it is not the same as even the conflict in northern Uganda because in Northern Ireland there was no real base for the IRA - the Republic of Ireland was not giving support to the IRA. Here you had a place - moreover a land border - not an island like Britain is, a land border where the neighbouring country was actively backing this terrorism and I'm not surprised myself that it lasted long because that was one of the factors. There are also other factors but that was one of them. Let's just stay with the conflict in the north for a moment and bring in our next caller who I think also wants to make a point about it. Ogwang Wacha from Silver Spring in the United States. Your perspective on the political situation here particularly taking into account the conflict in the north. Mr President you said that we do not have enough money and resources to stop the killing in northern Uganda. If that is true, then how come we have enough money and resources to go and fight in our neighbouring country? How come we have enough money and resources to bribe MPs to try and lift the term limit for you? Well your question ranged quite widely. But let's [focus] particularly on that first part about the north - the issue of resources. Well we have the resources but at one time we had the problem with our donor partners who were saying that we should not spend more than 1.9% of GDP on the army. That took a little bit of our time, until 2002 when we took a firm stand and insisted that we spend more on the army and we did it. So it is not that we don't have the money - we had the money - of course we don't have all the money we need for all the things we need. But we had the money to spend on the army but at one time, our partners did not want us to spend it, although we wanted to spend it and until we insisted and now we have spent adequately, that's why the situation is under control. Now our friend from Silver Springs talks about us fighting in other people's land. Yes, that fight in other people's land was part of the fight for the north. Because it was Sudan, which sponsored groups through the Congo to attack us from the west this time. It was called the Allied Democratic Front - ADF - so that's why we had to go into the Congo; it was part of the same struggle. I just wanted Ogwang Wacha to come back on those particular points. What do you think of the President's explanation? I still feel that as the President and as a citizen of Uganda, he should have done more - for 19 years he should have done more because the LRA have adopted over 20,000 children; they have displaced 1.4 million people in IDP camps. The 1.5 million people who have been displaced - the majority of them were displaced actually in the last two years when the terrorists were under pressure from us they tried to go new regions. That's when the number swelled. Otherwise the number was always around 800,000. But anyway it was part of the regional conflict. It was not an independent factor and those 20,000 children who have been abducted, most of them have been released. In fact, now the children in captivity are very, very few - there are hardly any. The total number of people still with the terrorists could not be more than 400. I want to bring in somebody who wants to remind you that he actually taught you at one point when you were a student in Dar es Salaam. Andrew Lyall from Dublin in Ireland. About the north perhaps but also as somebody who was one of the President's teachers. What do you feel about the general political developments taking place in the country? I'm not sure I taught the President very much; that's more a reflection on me than on him I'm sure. But we were members - the only two non-Tanzanian members, I think, of the TANU Youth League - that might bring back an occasion when we went to camp there in the bush near Bagamoyo. I was going to ask about the question of elections but up to now - 'til last November I think - the President's view was or it was the case that there were non-party elections. The constitutional court ruled, I think, last November, that it would be unconstitutional to deny party politics, as it were. I just want to ask him what his view on that is. Does he support the idea of party politics and how could you prevent them becoming ethnically based which has often been the problem in Africa? So is there a risk in this move, which you're now supporting and indeed have you come to it reluctantly because it was just a few years ago that you were pushing the continuation of the present movement as having great merits? It is not because of pressure. After 18 years quite a number of changes happened in our society. A lot of young people have grown up who didn't know the sectarianism of the past and even the people who have lived under the sectarianism of the past have seen the advantages of non-sectarian behaviour. Therefore, sectarianism which had been planted here throughout the colonial period, is now on the wane, on the decline and that's why we have decided that we should open up the system because sectarianism is on the decline but also there are other weaknesses in our movement system. Our movement system helped us to get rid sectarianism. It however brought in some other inefficiencies; like for instance, lack of cohesive behaviour because people, MPs, were being elected on individual merit. Whenever they would came to parliament they would behave in an anarchic way. They wouldn't have a collective stand - if you like a party line - and that had also caused a lot of inefficiency. So on one hand our original sickness, which was sectarianism, was on the decline and on the other hand some new problems were cropping up in the movement system itself. Therefore we decided it was time to open up. Andrew Lyall, do you think the President is right perhaps there to suggest that the sectarianism - the risks of sectarian strife of old are now passed? Well I think he's probably in a much better position to judge that. Yes, I think that's quite right that it was fermented in the past; particularly as the problem of landlord and tenant relations, for example, of Ugandan landlords with Ugandan tenants, and that type of thing. So I'm glad he thinks that's so. I just would like to ask, it was reported, I think, on a BBC website in some quarters, that the President's support for multiparty elections was in some way dependent upon whether he is permitted to run for a third term. I wonder whether he would comment on that as to whether that's true or not? Yes, there are some people who are saying that having two transitions at a go is risky. There is such an opinion that you cannot have a transition from movement to marked? ?organisation system - to a pluralist system - at the same time also have a change of leadership of the political management. There is such an opinion it is being said and it is all part of the discussion. But the question there of course is, would you have been going down the multiparty road yourself and now encouraging that if you weren't sure that you would be able to stand again? I accept what you said at the beginning of the programme about that, but have you done this in the belief that you will be able to continue? No, no, no, the two are not linked. But some of the people think that out of prudence it's better that way. But the move for opening up the political space was an independent factor. This is a special edition of Talking Point from State House, Kampala with President Yoweri Museveni. Let me bring in on the line now, Rone from Oslo in Norway. The point that you would want to make to the President? Since you came to power, you have operated a political system called the movement and now you say that it is time to change - to vote on the referendum on multiparty politics. How can you explain the definition of the two to the ordinary people in Africa and Uganda in particular? My second question, Sir, has your government prepared all the necessary funds to conduct the referendum process? If no, who will finance this process? The referendum will be financed by us and that's not a problem. But regarding the difference between the movement and the party system. The movement system is a multi ideological system. It is a system where you are able to accommodate different ideological lines under one political roof. Parties ideally should be uni-ideological, like the parties which you are familiar with in Europe, like for instance, the Labour Party. The Labour Party was a party of labour - it was the party of the workers initially who had one interest - fighting for the interests of workers. Then you had a Communist Party. The Communist Party is a party of communists. The Conservative Party was a party of some high class people; maybe middle-class; maybe the aristocrats initially. The movement therefore is always multi ideological. While the parties ideally should be uni-ideological. This is the difference which some people do not bother to understand. We have of course the G8 summit coming up in just a few days time now. Let's turn to some of the issues that will be coming up at the G8 summit which will be very much dealing with Africa. We've had emails from Naeem Hassan in Lahore, Pakistan who asks: How would you utilize the aid coming from the G8? That's assuming presumably that there is going to be substantially more aid. We have a email from Juliet in the UK who asks: With G8 around the corner and the Ugandan debt possibly wiped away altogether, what serious development should we be looking at? In other words, how do you propose to use any further debt relief, debt cancellation you have? And on this issue of debt, we have on the line, Nnamdi Francis from Enugu, Nigeria. Your question to the President? My question is, what is the justification for the call by most African countries, like South Africa, Nigeria, Uganda and some other countries, who ask for debt relief. When they are in power, the corrupt leaders enriched themselves with the abundance of these countries, now they are calling for debt relief. What is the guarantee that when these debts are looked into by these European countries and been caught or whatever, what is the justification, what is the assurance that you will actually make use of this debt relief for the benefit of that country and for the benefit of other African countries? I think there are quite a lot of people in the rest of the world aren't there who are concerned that if debts are to be relieved or cancelled that the money should be used properly and in particular that it shouldn't go, for example, on arms spending. The money which is forgiven for debt, cannot go for arms. It would normally go for education, for infrastructure. But I did not get his question very well - he was talking about justification. He's question was essentially about the use that is made of that money. Looking across Africa and the call there was from Nigeria. Do you share concerns about simply relieving debts, handing back the money, or indeed dishing out substantially more aid to Africa. Would you accept that there should be any sort of conditionality attached to that? The donor countries, for example, are now very often - and indeed I think we'll hear it at the G8 - expecting Africa to reform itself more politically to work much more actively to eradicate corruption to improve governance and so on. Is that kind of conditionality, if we can call it that, is that acceptable to you? I would like to approach all these subjects differently. An asymmetrical approach to the issue of underdevelopment of Africa, is not correct. You must have a comprehensive approach. Some of Africa remains backward by a combination of two sets of factors. One set of factors is the exogenous factors - factors coming from outside Africa - like debt, like being shut out of the markets of the West, like interference in the internal affairs of Africa because that is also one of the exogenous factors that has caused problems. Then there are indigenous factors, factors within Africa that also played a negative role in terms of development. For instance, interfering with the private property, lack of macro economic stability - yes, dictatorship and lack of democracy. These are all factors, some internal, some external, that caused the missing of the boat by Africa. Therefore, you cannot have one element and you think that that one would solve the problem - no - even if you forgive the debts. Much of course is made of eradicating corruption isn't it. Indeed, we've had emails from Jenny Namuddu, from Kampala who says: Mr. Museveni, nobody doubts the good that has come to Uganda under your leadership. Why have you not sent a clear message about corruption? An email from Nicholas Mutenga in London: Why after all these years has Uganda not been able to tackle its corruption problems? So that's a perception that's out there. That asymmetrical approach is very wrong because even if you handled corruption only - even if you put everybody in a convent and we are all not corrupt - but you do not produce wealth - you do not add value to raw materials - because one of the main factors of Africa's backwardness is actually donating Africa's wealth to the outside by exporting our precious coffee, we are donating money, we are donating jobs to Europe. The United Kingdom earns more money from coffee now than Uganda does and indeed Uganda is one of the biggest producers of coffee in the world. Why? Because the value is added to the coffee in the UK rather than in Uganda. Now unless you put everybody in a convent - and we they were not corrupt - but you did not resolve the structural distortions of, for instance, exporting raw materials, you can dance until midnight, you will not cause a development here. Let' just bring Chris from Winchester, UK in on this as our next caller. This is an issue I think you're concerned about as well isn't it? I am just a little bit concerned about the G8. In the next 10 days, highly indebted poor countries, under stress like Uganda, are said to receive 100% debt relief. Now our success post-debt relief is going to be down to good governance. Mr President, how do you expect our country, Uganda, to achieve success if your very government does not respect the constitution on sensitive issues like the time limit? Secondly, do you have any mechanisms to ensure that the corruption which has plagued our country for the last 20 years and this has put us into the top five most corrupt nations, do you have any mechanisms to make sure that this will not occur again if you are given another term? Uganda does not respect the constitution - that's madness. These are some of the lies which are being peddled and unfortunately being peddled by people who should be serious. What aspect of the constitution are we not respecting? We are talking of reviewing the constitution. We are talking of amending some aspects of the constitution. That does not show disrespect of the constitution. It shows [how] meticulous the constitution is - if there is a provision of the constitution, you abide by it until you amend it legally. If it is done legally - what's wrong? What is the issue? I cannot even follow the argument. Christopher, are you convinced by that? I am fine by that. Although of course he was pressing again on the point of corruption, wasn't he? The corruption - our movement has handled - in 1986 we had a multiplicity of problems. There was criminality by state agencies - killings - extra judicial killings - looting, smuggling - the black market - we had all those problems. All these matters have been resolved. Why is there no more black market? What happened to the black market? Christopher, do you accept that - all those problems resolved? No, no no. Some of those problems have been resolved. Then you have some which are still lingering - like embezzlement, like misuse of office, like bribery. And that one we are also tackling because the crucial thing here is what sort of soldiers are you relying on to solve a particular problem. In order to stop the extra-judicial killings, we relied on the army to stop that - we created a new type of army. But in order to stop embezzlement, we need a different type of soldier - we need an accountant, we need an auditor, we need a prosecutor, we need a new set of people, which we are in the process of creating. And that's how we are getting all these successes. If there was so much corruption, how do we get a rate of growth of 6.3% every year for the last 18 years? I think we must leave that one there. This is a special edition of Talking Point from State House in Kampala, with President Yoweri Museveni. Let's turn to Zimbabwe, which is a very topical issue with the demolition of properties around Harare recently. We've had emails on this including this one from George Grams, Canada who says: Can the president please give us his view on the recent demolition of homes and business premises in Zimbabwe? Peter Ross, London, UK who asks: Mr Museveni do you support President Mugabe bulldozing thousands of people's homes and businesses in Zimbabwe? As Uganda also had Idi Amin is there hope in Africa if Africans don't stand up for the many poor and dispossessed people? Let me bring on the line Richard Price from the United Kingdom on this same issue. First of all I'd just like to say thank you for speaking to me. It is a great privilege for me to talk to you as an African leader I've long admired. My question does concern Zimbabwe and is rather like several of the questions that have just been read out. I think there are parallels to the Uganda you inherited in 1986 and the current situation in Zimbabwe. In '86 Uganda had petrol shortages, shortages of food stuffs, lack of law and order, etc. It was rather like Zimbabwe today - rather a basket case - which you successfully have turned around. I want to firstly ask you what your views are on President Mugabe himself and the current situation in Zimbabwe? Secondly, given the parallels between the Uganda of the late '70s and early '80s and the current situation in Zimbabwe, whether you, as a respected African leader, would ever consider uniting the other leaders of Africa against this despotic madman, Mugabe? I think Mr Museveni is having a little difficulty hearing you but the essence of the question there: shouldn't African leaders be speaking out more about what is happening in Zimbabwe and indeed you in particular? Well Africans speaking out about African misbehaviour. It is misbehaviour in Zimbabwe is it? Generally speaking. There is a perception which is being peddled around that Africans are keeping quiet about other Africans misbehaving. This is not correct. We are the ones that got rid of Idi Amin by ourselves, no outside help was extended to us. Richard Price was just making that point and therefore feeling there was all the more reason for you to speak out about the kind of thing that's been happening recently in Zimbabwe. Just wait a minute. I want to illuminate for the audience, how many times Africans have stood up by themselves against their own kith and kin who gets out of line and the first example is Idi Amin. We, together with our Tanzanian brothers, and to some extent Dr Kaunda in Zambia, we stood up against Idi Amin until we got rid of him ourselves - no help from outside. Sudan, you've been asking about the north. Part of the north has been our conflict with the Sudan. We alone stood up against the Sudan government - the genocide in Rwanda. If I cut you short, because our time is a little short here but all of that may have happened - all of that action may have been taken but what about the specific issue of Zimbabwe today? What about Continental organization, the African Union? At one time the Commonwealth group - so some of us sat back and waited for that group to report because there were people who were nominated - the Prime Minister of Australia, I think General Obasanjo and some other people. So we sat back because I don't want to interfere in an issue which is not directly under my responsibility. Because there are so many players in Zimbabwe - there is no structured way of handling anything. On the one hand you hear the British government firing off their opinions. So it becomes now a bilateral matter. If the British are saying that, Mugabe is saying that - what do I say - because I am not part of Mugabe's government, I am not part of the British government. They fire off opinions without consulting us. The only structural involvement where I was involved was the Commonwealth and we nominated the Prime Minister of Australia, we nominated General Obasanjo and somebody else. These should be the ones to guide us. Would you like to see action of some kind? Would you like to see things being said about it - whatever the way in which it is done? Is there a case for Africa speaking out? I would like to see a structured approach to a problem - a structured serious - not propagandist approach to a problem. If should be a committee like that committee of the Commonwealth. If Uganda had been nominated on that committee we would then have been able to study the issue in detail and give opinions. But now this is just propaganda - just firing off impromptu opinions in the papers. This is not helpful at all and it's not serious. Let's turn to an issue that is of great relevance to Uganda of course and that is HIV/Aids. An email from Bernard W, in Gulu in northern Uganda who says: What effect will the recent u-turn America and also US AID is taking regarding the promotion of condoms have on your quite successful campaign against HIV and Aids? An email from Isaac Russell from Yuma, Arizona, USA who says: Mr Museveni, please stand up to the Bush administration in the following way. Demand that the abstinence first and foremost clauses be dropped as conditions for aid money with regard to fighting AIDS and redistribute all the condoms, which, I have read, were collected by the government. Who brings up this idea of either condoms or abstinence? Our formula is, all are needed. The ones who can abstain, abstain. The ones who are married and can be faithful in the marriage, I encourage it. But the ones who cannot, I encourage you to use the condom. Is this the case as much as it always was because certainly the impression has got about that there's been a move much more towards emphasising abstinence and indeed an impression that that is as a result of influence from the United States. I can never support that because that's murder. Because if there is a prostitute who is already having risky behaviour, how can you discourage her from using the condom? If you have got faith-based groups - groups which are religious based - surely they want this prostitute to remain Aids free until they can convert her to Christianity. So it is better she is alive rather than when they find that she's dead or sick. So neither group should insist on extreme positions. The condom people should not say everybody must be condomised - because that's what they are saying - the whole world should be condomised; that all human behaviour should go through condoms - no, that's not correct. Let the ones who can abstain, abstain; let the ones who can be faithful in marriage, be so. This has always been our stand. And condoms will still be available for use in the way they always have been? There's no holding back on that? No, but maybe there's a problem of distributing condoms in primary schools and maybe there was a problem there. That could have been the problem of very young children - sort of sensitizing them - waking them up - maybe this is what they are talking about - when the children are too young and you start giving them condoms, even when they are not aware of sexuality. Maybe that is what is being talked about which has been misunderstood. Let's ask you very briefly, from all that you've experienced here on this issue, do you feel that the world still appreciates the scale of the threat of Aids - of the pandemic - to Africa? Well, I don't know if the world - initially they didn't but for us here we took it very seriously. We shouted at the top of our voices to our own people and our people responded and they changed their behaviour and they are careful and the prevalence came down. But I don't know - of course not enough money is spent on research, that's true. Much more money could have been spent on research. On that most vital of issues for this continent and undoubtedly one of the big issues at the G8 summit in the coming days as well, we must end. I'm afraid that's all we have time for. My thanks to our guest, President Yoweri Museveni of Uganda and from State House in Kampala, that's all for now from me Mike Wooldridge and the Talking Point team. Goodbye.